So an Exception is mostly not a struct, and doesn't work like one. However structKeyExists() does work, and duplicate()-ing an Exception actually returns a struct, not a duplicate of what was passed in. The latter is definitely a bug. duplicate() should either return a duplicate of what it's passed, or it should error if it's not able to do that. It should not return something that's kind of a cheap Adobe knock-off of the original object. Hmmm. There's a coupla glitches there. If Lucee's gonna maintain that an Exception is a struct, then struct methods need to work on it, and keyExists() doesn't (I presume others don't too). 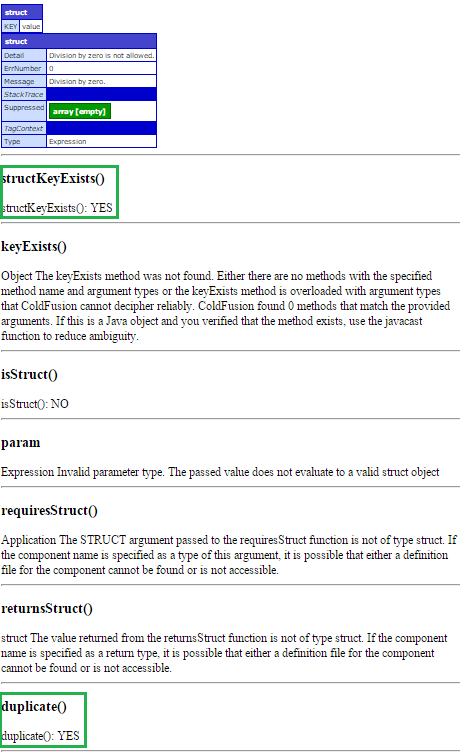 Also my test for returnsStruct() checks if the returned value is an object (just to get a true to display for the ColdFusion version, to make sure it was still an Exception). However it seems Lucee thinks an Exception object - whilst being a struct - is not an object. Humph. So a few Lucee bugs here too. Anyway, enough of this nonsense. Just bear in mind that an Exception object is not a struct. Other than when it is. Sigh. Lucee not considering an Exception an object: LDEV-323.